With an undercurrent of Shakespearian gravity supplied by its title, The Ides of March takes place in the days leading to the Ohio Primary, March 15, when democratic hopeful Governor Mike Morris (George Clooney, who co-wrote and directed) hopes to defeat his opponent for his party’s nomination, after which he’s a shoo-in for the Presidency. Of course, given the title, those who remember Julius Caesar may question if Morris makes it that far. Fortunately, the film, based on the off-Broadway play Farragut North by Beau Willimon and co-written by Willimon and Grant Heslov, does not involve an assassination. At least, not a literal one. 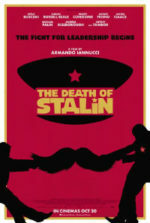 Here’s a film about the death of idealism at the hands of a compromised political and electoral system; and sadly, it’s told with enough realism and basis in truth to make it a disheartening tragedy for every American. Driving Morris’ campaign are pragmatic manager Paul Zara (Philip Seymour Hoffman) and strategist Stephen Myers (Ryan Gosling), the latter a campaign wunderkind who draws the attention of the opposition’s top dog, Tom Duffy (Paul Giamatti). Myers has worked several campaigns, but never has he believed in one so much as Morris’—a Kennedy-esque Democrat and visionary determined not only to eliminate the need for fossil fuels through a push for technological advances, but he seeks to initiate a novel plan to promote government-funded college education. With his suave good-looks and squeaky clean history, the progressive Morris is the perfect candidate, and Myers has drunk the proverbial Kool-Aid. It’s not that Morris’ liberal ideas aren’t important or even infeasible; but Myers believes Morris is incapable of dirty politics, a belief he learns goes beyond naïve. Clooney’s personal politics come to the forefront of the film, and those who share his view that the American political process has broken down will find the story insightful and powerful. It’s a cynical perspective, mind you, and also a reflective one—in the same way, that his film Good Night, and Good Luck echoed the damaged state of the modern media. Morris’ victory depends on securing the endorsement of Senator Thompson (Jeffrey Wright), whose 300 pledged delegates will make or break the primary for Morris. Zara and Duffy both work their magic on Thompson, who wants a Secretary of State position in exchange for his support. But which nominee will Thompson choose, and why? Meanwhile, Myers begins a casual affair with a young intern (Evan Rachel Wood), and he realizes that she has a secret which could affect the campaign. Tension builds once the backstabbing begins, allowing Clooney’s impressive cast to show their stuff. Gosling follows Drive with another impressive performance that surprises with the actor’s seeming innocence, which soon develops into something decidedly more calculating. 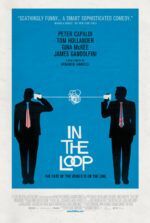 Hoffman, Giamatti, and Clooney himself all give solid performances, each with one or two key scenes that define their characters. Hoffman’s plain-speaking Paul gives an intense monologue about loyalty, whereas Giamatti’s Duffy delivers the disparaging equivalent—both actors are perfectly tuned to their respective characters. Likewise, Clooney’s natural charisma makes him a believable politician (hell, I’d vote for him). Also appearing are Marisa Tomei as a reporter hunting for a scoop on Morris’ campaign, Max Minghella as a campaign lackey, and Jennifer Ehle as Morris’ devoted wife. As a whole, the cast enhances every moment both through their star power and their sheer talent. When it’s all over, The Ides of March leaves you in despair about our political system. 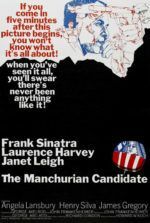 And yet, for all its condemnations, the film remains fairly impartial on party sensibilities, despite taking place around a Democratic election. It fades to black for an ambiguous conclusion and begs us to question how we can ever trust a politician, slippery as they are in the games they play. It hopes that we consider what a corrupt political system says about Americans, who continue to accept such corruption as an unfortunate truth about our government. This is not an issue of Democrat vs. Republican, but one of politicians as the whole serving the Constitution (as opposed to serving themselves $16 muffins). However jaded this viewpoint may be, it’s a fair stance in a structure where personal agendas prevent forward progress for the greater good. Certainly, devoted party members on both sides will have a problem viewing Democrats as scheming deceivers and Republicans as aged power-mongers, but Clooney isn’t speaking to people deeply involved in politics; he’s talking to everyone else. These are not new ideas, per se, but Clooney presents them with clear direction and a strict sense of economy in the plot, backing both elements with incredible performances all around. As always, his capabilities as a filmmaker remain strong, the unassuming thriller tone designed to service the story. Indeed, Clooney doesn’t have a distinct personal directorial style, but on every film (from Confessions of a Dangerous Mind to Leatherheads) he shows the confident hand of an experienced craftsman. Building at a slow momentum, there’s no violence or action to speak of here, just strong dialogue and a compelling tale told without stepping onto a soapbox or flipping on the bullhorn. 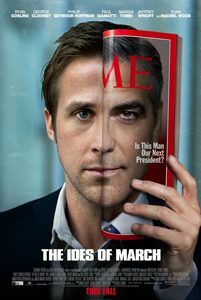 The Ides of March makes for a distressing morality play, something birthed from a marriage of The Candidate and Sweet Smell of Success, and just as bittersweet. And though it may not shape your vote in the coming election, it will make you feel awful about your pick, whoever you choose.